I found one similar, but I don’t know if it’s right because it’s the CH340 button one and the 8 pin has a hole in it. OK here is an interrum fix. There are still problems in schecmatic (missing terminalIds and breadboard (missing layerId) but pcb is now generates what appear to be correct gerbers. If you could check it against a real board that would be appreciated. I’ll fix the rest of the problems tomorrow. Does your Mega2560 R3 Pro Mini fit on a printout of that footprint, because it’s too narrow compared to the CH340 Mega2560 R3 Pro Mini. There is something wrong here because my original part is correct to the CH340 Mega2560 R3 Pro Mini drawing I found, and not 0.100" too wide. EDIT - looks like the blue 16u2 is 36.8mm wide, and the black CH340 is 38mm wide. Thanks @vanepp, I haven’t checked the updated version yet but will check tonight. @Old_Grey, I tested the blue one with the ATMETGA16U, not CH340 chip, about 36.8mmx54.2mm and it fits perfectly. Just wanted to check. I should change mine to black and make a CH340 version because it’s 1 row wider like the CH340’s 68mm. Please hold off on that til I get this fixed. I’m just cleaning up schematic, but won’t (right now) renumber it so as to not bread current sketches. After that is done I’ll create a new part with pin numbers in sequence (like most Arduinos these are not) and would prefer new parts to be cloned from that so they are correct going forward. I just found another black one that is 0.100" shorter, with no USB but pins in the PCB. I think RobotDyn makes the black ones. The last image has a size comparison. EDIT - On 2nd thought there is a lot to change in the BB view, and it’s probably not that big of a seller. With this little board you use many pins in your projects. So what can you build with this board you might ask?. | eBay! EDIT EDIT - Found a better side-by-side. OK, here is a properly updated version of this part. Fair warning, something I managed to do in the test sketch has managed to offset the silkscreen in the gerbers (for only the test sketch, just a part has the silkscreen correct) which I can’t see any reason for so I think the part works. If I get ambitious (or bored or frustrated with development ) I may fix this properly and renumber the pins. As it stands the pin numbers are not contiguous and that usually causes problems with the hover on the pin and it displays the description code although in a quick test I can’t see it happening. The down side to making this change (and why I didn’t do it here) is that it will break all existing sketches. This may be good enough, we will see. Edit3: removed RST from bus as they are all seperate, centered the usb connector and CPU chip in breadboard. Waiting to see if more bus changes are needed. I can’t get the part imported - part already loaded problem that I can’t seam to fix -, but the 8 pin header and 6 holes are still faulty. My orig part on the left is fine, so I don’t know what the guy did to damage it. What’s wrong with the silk, because mine looks ok. Damn! Last night and earlier this morning the silk looked fine in Fritzing but was offset in gerbv by about 1/2 inch, so the border around the mega pins was in the wrong place. I just reloaded the sketch in gerbv to print out the problem and now its fine! That’s why I didn’t post this last night when I finished it. Don’t know what that is about, but looks like a gerbv issue rather than Fritzing although I’ve never seen it before and can’t reproduce it now. The “part already loaded” error can be fixed by deleting the part in the mine parts bin (I think you have to restart fritzing to get it to actually delete) and if that doesn’t work, either clearing the user directories or remove the fzp file for the mega in My Documents\fritzing\parts\user. The major problem is the 8pin is still wrong. Do we need the ICSP header, because that is programming header and not something a shield will need. I don’t have one, so I’m a poor one to say. The fellow who has one would probably have a better answer than me. Do you want my original 0.100" part, because it’s not broken like that one. I hope that guy didn’t use the interim part. I wonder if the svg for the original hasn’t been deleted from your my documents svg directory (because I didn’t change the file names) and you are getting the old version? That version was in the test sketch. I tried renaming the internal .fzp file of the fixed part but it said part already in bin, so I didn’t test that one. EDIT - Got the fixed part in and it’s ok now. 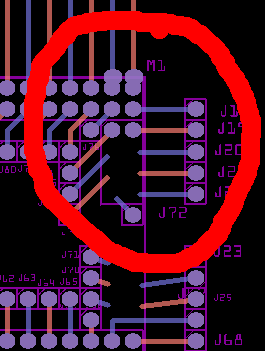 The 16U ISCP header would be great because they PCB routing keeps trying to use them as GND, since they are all marked as GND. The problem is people use that board as a template for a shield, and the empty holes in the shield would take up extra area that you could use to lay tracks. If you look at all the Arduino boards the ICSP don’t work. On the other hand, if you want to make a tutorial on how to connect a ICSP to this board you would want them to work. I’m more inclined to the first. 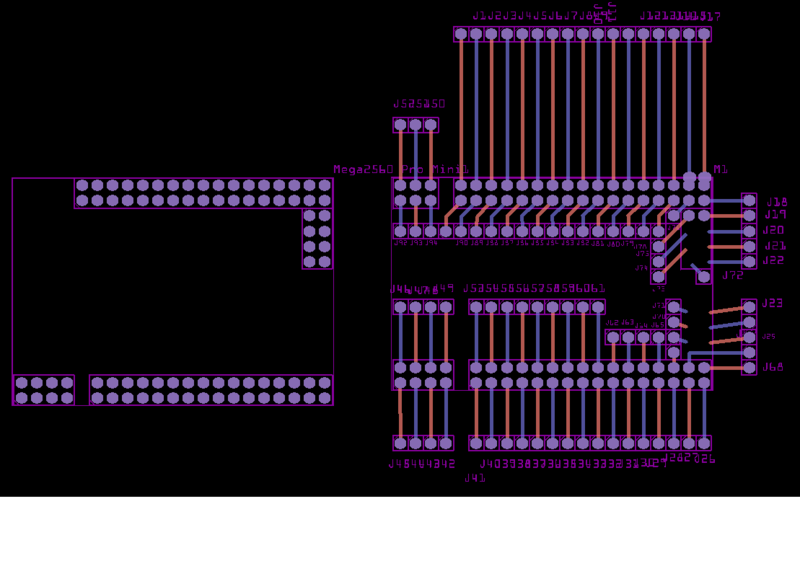 OK, I’ll change it to match your pinout. Old_Grey: there isn’t any reason to not have two parts, one with the ISCP and one without. Then the user can choose which to use. I’m inclined to do the renumber then split them that way. Is it only the ISCP connector you think should go? On the shield version we could move the pads to silk screen so they could at least have holes if they needed too. edit: Is it a correct assumption that these share the same named pins else where and thus should be bused to the other pins? up to you with a board in hand :-). 381 382 383                               367 gnd? 374 gnd? 384 385 386                               369 51    372 58?
? ?   ? 370 53    371 57? I’m not too worried about the ICSP, just leave it. 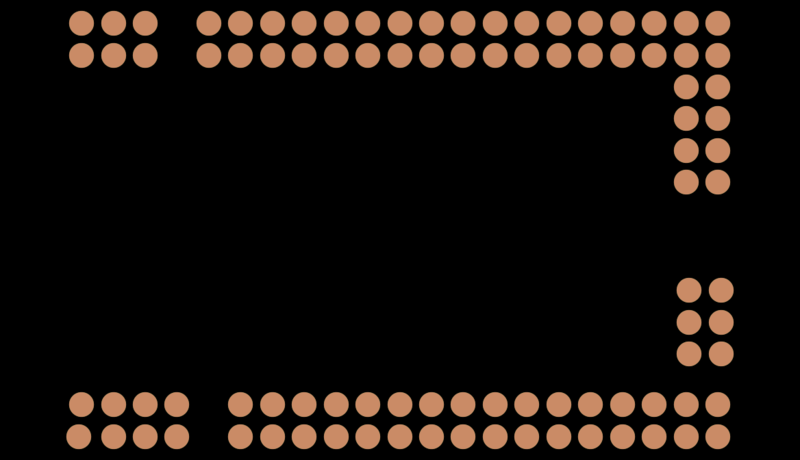 The left ICSP is for the 16u2 chip, and the right ICSP is for the MEGA2560 chip, so I suppose they should not be connected. Not sure there is a PWR, but the single GNDs should be common. Right but they are all labeled ground at the moment, which is incorrect.